The reviews are coming in. Poppy Hills was played for the first time since March 10, 2013. So, what does everything think of the new course? I can’t tell you how excited I am that this is back. It brought Poppy Hills back to relevance. Having played it now and seeing how much better it is … this is definitely a part of anybody’s itinerary going to the Monterey Peninsula. He’s 74 years old and you would have thought he was 14 years old running around on Christmas morning. Every time I hit a tee shot, he knew where it was going to bounce before it hit the ground. … Yesterday marked a point where I learned more than I can even share. The Northern California Golf Association is the most progressive golf association in the country. …all-in-all, this course was pretty close to perfect. A sneak-peek at overhauled Poppy Hills Golf Course in Monterey reveals a vastly different layout: faster and firmer with wider fairways and freshly opened vistas like this stunner from the tee box of the reborn 12th hole. … The metamorphosis of the 12th marks one of the more striking changes to a course that’s been so dramatically transformed, it now appears as a different creature altogether. Its forgiving landing zones and rustic waste areas, fringed by native grasses, reflect a throwback aesthetic. The new Poppy isn’t just faster and firmer. It’s fairer, too, meting out its punishments without swallowing an unnecessary number of balls. The layout also consumes less water, thanks to the removal of nearly 20 acres of irrigated turf. … No doubt it reflects an aesthetic that had largely been abandoned in the modern era but now, happily, has been embraced again. The transformation is startling, the results spectacular. Another bite of the apple, and the taste is especially sweet. The remodeled layout combines risk, reward, and playability in a pristine Del Monte Forest setting. 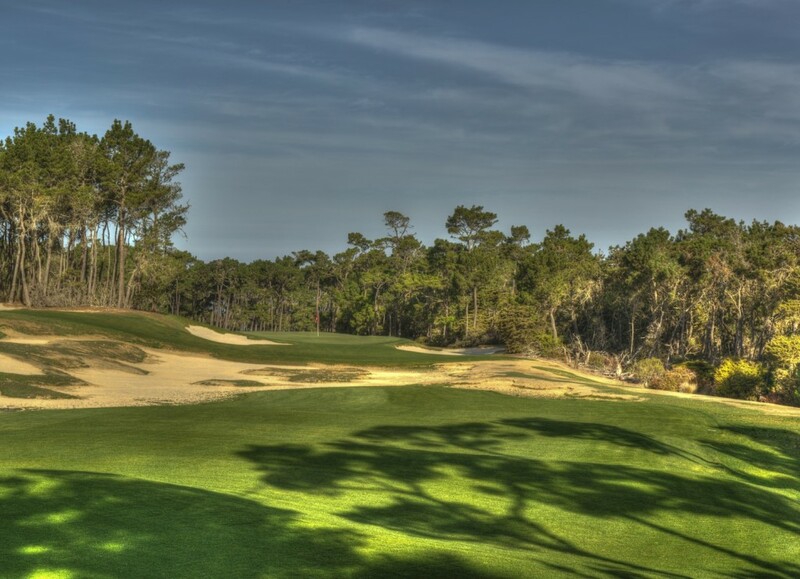 … In short, the new Poppy Hills is a dramatic re-imagining and reconfiguring of the NCGA’s flagship course, elevating the layout to an equal footing with its world-renowned neighbors in “Golf’s Greatest Zip Code”. 93953 might not look too good on a scorecard, unless it happens to be part of the address of the course on the back flap. That means it would be located in Pebble Beach, Calif.—“the best zip code in golf,” as the saying goes. Well, with the reopening of Poppy Hills on April 4th, the neighborhood is about to get even better. “Fast. Firm. Fun.” is the new mantra, embroidered on the commemorative opening day cap. The fairways are easy to hit if you play the right tees, and the ground game has been brought into play with the closely-mown areas and slopes around the greens. Like Bandon Dunes? You’ll love Poppy. Before, this course fought the land on which it was born. Now the two get along just fine, moving through some of America’s most revered golf landscape in perfect rhythm. … And that means a friendship reborn for golfers of every type, from pro to beginner. Not only is the Robert Trent Jones Jr. design back in business, it’s receiving rave reviews. If you have been deemed born-again “relevant” with Pebble Beach not far away, you have passed a major test. Virtually all rough has been eliminated as the edges of the fairways transition easily into the bordering forests, not unlike Augusta National. All told, Poppy’s comeback shows that it again belongs in the 93953. Reborn, rebuilt, re-birthed, restyled, re-established, refashioned, re-engineered, or renovated? 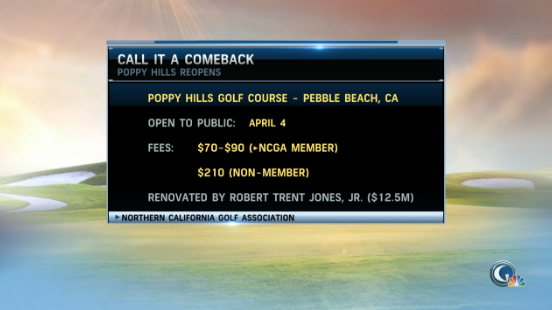 No matter what you call it, the news about Poppy Hills in Pebble Beach, CA is exciting. There’s been some major surgery, more than a simple facelift done on the Northern California Golf Association’s game-breaking Home Golf Course, and it’s marvelous. Golfers take notice: a new gem of a golf course inhabits the Monterey Forest. @AshleyKMayo Most definitely back 9 of Pacific Grove. Poppy Hills is now Pinehurst-like. Oh yeah, La Jolla CC. . . You need a month. It’s everything you thought it would be, and more. I have been in the profession of golf course architecture for 33 years, and I have never seen a better grow-in. The superb playing conditions displayed for the Grand Opening at Poppy Hills are the best I have ever seen. To have turf grass surfaces playing so pure and well groomed has elevated the new Poppy Hills to a standard that will be difficult for other courses to match. As I’ve gotten to know the new Poppy Hills—which revolutionizes its water efficiency while enjoying an artistic layout Jones compares to a signature painting—my favorite part of the transformation is happening off the course. 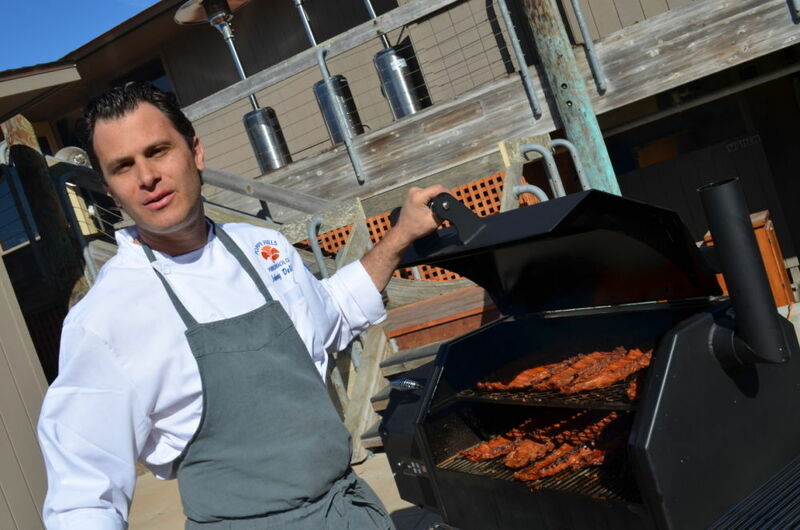 Poppy scored a surprisingly sophisticated chef for a golf course clubhouse when it landed former Casanova chef and artist-in-his-own-right Johnny De Vivo. He gets to do something trending that he’s thoroughly excited about: comfort food with an expert touch of sophistication. And he gets to do what he wants. Poppy Hills has always been a really nice golf course with an ordinary restaurant. Now a wider audience — from hungry golfers swapping lies to discriminating diners craving something deliciously different — can mix and match at a remarkable 19th hole. We’ll keep you posted as more reviews come in! Want to come up with your own review? Reserve a tee time at Poppy Hills today! Tags: Golf ChannelGolf.comMatt Ginellapoppy hillsReviewRobert Trent Jones Jr.